The nerves are made up of cells called neurons that line up end to end. 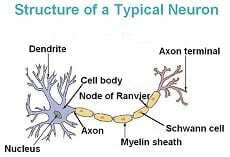 Each neuron is made up of a dendrite, cell body and nucleus, axon, and axon terminal. Dendrites receive information from stimuli and send it via electrical impulses to the cell body and to the axon to be transmitted away to the next neuron. The axons are coated in protective coverings called the myelin sheath. The myelin sheath spirals around sections of the axons with gaps in between. The myelin sheath is a fatty substance that not only protects the axon, but also aids in transport of electrical signals. The gaps allow the electrical signals to quickly move along from one neuron to the next. Think about this: When we touch something hot, we quickly move our hand away from the burning substance. We don’t have to think about the steps it takes to move the hand, it just happens. The impulses move from our hand that is getting damaged from the heat to our brain to be analyzed, and a decision must be quickly made using past experience as a guide to remove the hand from the stimulus. This happens quicker than we can think it through. In fact, quicker then we can think “Yikes, that’s hot!” our body has already reconciled the issue. Our nerves then send signals to our immune system to do its work to repair the damage. We may literally have frazzled nerves when the myelin sheath is damaged. This damage can happen via diseases such as multiple sclerosis, spinal cord injuries and strokes, or long term chronic stress. Stress can come in many forms: mental/physical/verbal/sexual abuse as a child or adult, life transitions such as marriage, divorce, death, moving, changing jobs, and raising children are just a few examples. Pharmaceuticals such as statins can demyelinate the nerves. Once damaged, the ability for nerves in the spinal cord and brain to communicate with the muscles is compromised. Damaged nerves mean damaged pathways. Long term stress can trigger changes in brain structure and function. This can lead to mental problems such as anxiety and panic disorders, PTSD, and cognitive function. Cortisol, a stress hormone that helps us to wake up in the morning, is produced slower than adrenaline, but lingers longer in the bloodstream. It is produced in the adrenals, which sit on top of our kidneys. When we have levels of cortisol that are too high or too low over long term, we can show symptoms of lost energy, enthusiasm, and confidence. Prolonged stress alters the effectiveness of cortisol to regulate the inflammatory response, because it decreases tissue sensitivity to the hormone. Specifically, immune cells become insensitive to cortisol’s regulatory response, and do not react as needed. In 1936, Hans Selye, a pioneering endocrinologist known for his research on the effects of stress on the human body, defined stress as “the non-specific response of the body to any demand for change”. Stress on the body and emotions, which can originate from both good and negative stimuli, may debilitate us mentally, physically, emotionally, and spiritually. At times of stress, we may have feelings of helplessness, hopelessness, and depression. It could cause a plethora of physical symptoms and ailments. When stress happens, our mind and body have several mechanisms for handling the mental and physical manifestations. Chronic stress contributes to chronic inflammation as the body responds to any stress with histamine reaction. Chronic inflammation can lead to diseases such as fibromyalgia, SEID (chronic fatigue), and even cancer. The mind can shut down. The term “can’t think straight” becomes a real thing. In fact, there are those who say that all disease starts with inflammation. Again, our moods are a function of nerve strength. A large portion of our relaxing neurotransmitters, such as GABA (gamma_aminobutyric acid), are synthesized in our small intestine and released in the bloodstream. Digestive health is key to a healthy nervous system. Heal and feed the gut with food, herbs, probiotics, exercise, exposure to the sun, and relaxation techniques so that you have less anxiety and depression, sleep better, and are better able to cope with day to day and bigger stresses as they happen. Dr. Jack Kruse is a highly intelligent neurosurgeon who has done extensive research on the health benefits of the sun on the mitochondria and the body as a whole. He continues to research this subject in conjunction with extensive research on the extreme damage that EMFs, or electromagnetic fields, wreak on our bodies. EMFs bombard us from computers, smartphones, tablets, wiring, wireless routers, cell towers, etc. Not only do EMFs disrupt sleep patterns, but also cause damage to mitochondria, neurological and behavioral changes, chronic fatigue, and more. You can utilize bio hacks to protect yourself by unplugging your router at night and when you’re not using it. Put your phone on airplane when not using, utilize the speaker vs holding the phone up to your head when on a call. Put all technology on “night” to reduce blue light. Use blue blocking glasses after dark. Stand in the sun as often as you can. Take breaks during the day to do this. Splash ice cold water on your face, particularly on your closed eyes each morning, and a few times a day when on the computer. For further information, go to www.jackkruse.com. As the myelin sheath is made of fat and protein, it’s important to take note that a non- or low fat and/or low protein diet is very harmful to nerve health and our ability to withstand stress of any kind. Foods rich in good fats, proteins, vitamin B complex, vitamin D3, and calcium nourish the nerves and give them the building blocks for repair and maintenance. Proteins are broken down by our body into amino acids. Amino acids are then used by every cell in our body to create specific proteins for function, repair, and metabolization. Schwann cells, a type of glial cell, located adjacent to the nerve cells use protein, phospholipids, and cholesterol to synthesize myelin. The myelin is secreted by the Schwann cells and spiral around the axon. How cool is that?! Science geeks unite! Fermented foods stimulate a histamine response in many people, which can lead to chronic inflammation. Take care to limit the volume of fermented foods eaten, and consider taking a quality probiotic blend in capsule form instead. Probiotics taken in this form do not cause the histamine reaction that fermented foods can. Limit sugar intake. Sugar takes us from 90 mph to 0 mph in a matter of minutes. The stress it puts on the immune, endocrine, and nervous systems is great. Sugar addiction leads to a cycle of stress and sugar intake that can be debilitating. When a sugar addict is stressed out, the intake increases. Note the candy commercial where the regular everyday person becomes a famous diva who is “hangry.” The candy company wants you to choose their sugar laden confections over nutrient rich food for that quick high and money in their pockets. It takes some doing but breaking a sugar addiction is actually quite easy. Read ingredients for hidden sugar. Choose wisely. Notice how your body and level of anxiety responds to better choices. After a period of time, most people report that sugar no longer carries the same fascination and need to consume as it had in the past. Lentils, avocados, fish, egg yolks, nutritional yeast, dairy, organic liver, olive oil, nuts, beans, broccoli, cabbage, Brussels sprouts, oregano, basil, dandelions, and oats are just a few examples of nutrient dense, nerve healing foods. Add these healthy foods to the diet, and feel the benefits to your physical and emotional health. Nettles – Urtica dioica. Nettle’s anti-inflammatory action is beneficial for reducing stress related inflammation. It is a micro-nutrient rich green food that helps build blood and tissues, gives our mitochondria what it needs to make fuel to keep our bodies working properly, and contains acetylcholine and serotonin. While nettles are popular for treating adrenal fatigue, I do not recommend them for this purpose. Nettles are powerfully stimulating to the adrenals. Anything that is stimulating to an organ or system and used for long periods of time can create a negative health effect. Use nettles sparingly in this case and short term only. Many people subscribe to the “more is better” regimen when utilizing nettles, which is a detriment in the long run. Think of it this way: Cortisol and adrenaline are synthesized in the adrenals. When continually hit with a stimulant, the adrenals can over produce these hormones, putting the body in a constant fight or flight mode. Overuse of nettles can lead to greater adrenal fatigue. In the short term, an upswing of energy is felt; however, eventually all things need to rest. Herbs such as Devil’s Club – Oplopanax horridum, Dandelion – Taraxacum officinale, and Ashwaganda – Withiana somnifera, help to strengthen the adrenals, help deal with adrenal fatigue, and support the adrenals to do the job they are meant to do each day. Ashwaganda – Withiana somnifera – can reduce anxiety disorders when taken consistently over time, and plays an important role in calming the mind in crisis. Motherwort – Leonurus cardiaca – helps to quell the rising of panic. As “wort” is an old English word for plant, think of motherwort as a plant that gives the unconditional love that is missed from broken mother/child relationships. 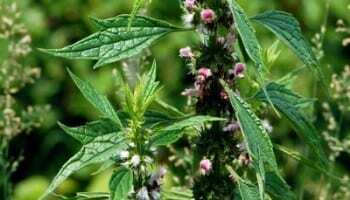 Motherwort can be taken daily as needed. The botanical name for motherwort, Leonurus cardiaca, means lionhearted – fearless, bold, daring. Be daring again. Valerian – Being a wildcrafter, I utilize Sitka Valerian, or Valeriana sitchensis, over the garden variety, Valeriana officinalis. Sitka valerian contains isovaleric and valeric acids. They are similar in structure and action to the neurotransmitters GABA (gamma_aminobutyric acid), and GBH (gamma_hydroxybutyrate). GABA reduces nervous excitability, anxiety, panic and tension – restoring homeostasis, and GBH is a central nervous system depressant. Valerian is very helpful in decreasing nerve pain and neuralgia. It slows the heart rate, increasing force, which may help to reduce palpitations. It is effective as a sedative and can improve sleep quality. Valerian root is antispasmodic, powerfully nervine, and sedative. It can be used externally as an oil or internally in tincture form. Take small doses in acute situations. Valerian is not for long-term usage, as it can promote excitability, lethargy, and a valerian “hangover.” Valerian is not for every person. For some, the muscle relaxing effects happen in concurrence of emotional instability and overexcitability. Not a good combo. Lemon Balm – Melissa officinalis – lifts the spirits and brings the sunshine back to the soul. Lemon balm has an antiviral effect against herpes. It seems to work best to utilize lemon balm on a daily basis during stressful times to prevent eruptions of herpes lesions. Seaweeds are excellent food for the nervous system. Magnesium and phosphorous content in seaweeds aid nerve health. Good freshly dried seaweeds do not have a “fishy” taste. Seaweed powdered and tossed on popcorn and chicken, pasta, tuna, grain and green salads is a delicious and nutritious treat. Try it on fried eggs, on toast, in dips. Gomasio is a combination of powdered seaweed and roasted sesame seeds. Sprinkle on anything you would in place of salt. You can combine the gomasio blend with a small amount of powdered nettles for an extra mineral rich boost. 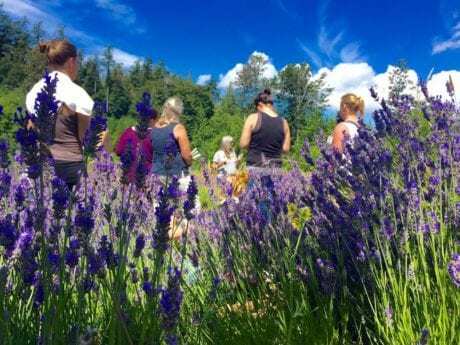 Lavender – Lavandula spp. – Scientists and herbalists alike have found myriad ways that lavender can be used for healing, cooking, home & hearth! Lavender isn’t just a wonderful smelling plant. It calms a mind that’s moving too fast in too many directions; helps to bring back focus. Lavender helps to quell feelings of anxiety and panic. A few drops of lavender essential oil on a pillow helps to bring long restful sleep. It helps to clear up cold sores. Lavender stimulates cell proliferation at wound sites, meaning it encourages healthy cells around a wound to replicate quickly to close and heal a wound. It takes the heat out of a burn whether from in the kitchen or sun. In the home, lavender kills bacteria and mold on surfaces and creates a lovely welcoming scent. Mugwort – Artemisia suksdorfii – can be utilized in tea, smoked, tincture, vinegar, oxymel, and elixir to cool down, relieve stress, and generally chill out. It gives a person a feeling of well-being and serenity. The caveat with mugwort is that it may produce vivid dreams at night, which could interfere with getting enough restful sleep. This does not happen with everyone, but to be on the safe side, try it during the day the first time you use it. Chamomile – Matricaria chamomilla – is a safe and effective sedative and soothing nervine used to reduce the effects of stress, anxiety and panic. Additionally, chamomile is anti-inflammatory. My favorite way to utilize chamomile (besides a cuppa) is to soak fresh chamomile flowers in honey for a few weeks. I spoon out the chamomile with the honey and drizzle in tea, on toast, cereal, yogurt, even ice cream! Oats – Avena sativa – help to repair the protective myelin sheath. We can have frazzled nerves physically, which can cause frazzled nerves, emotionally. Oats are not just for breakfast! Make a tasty oxymel by filling a jar halfway with steel cut oats, then fill the jar by adding 1 part apple cider vinegar, and 1 part local honey. Put on a lid; let it sit for 3 weeks, then strain. Consider adding add a tablespoon of the oxymel to a glass of fizzy water for a tasty nerve healing shrub. Hawthorn – Crataegus monogyna or C. douglasii and Wild Rose – Rosa nutkana – are the “Hope and faith and everything will be ok” herbs. Both strengthen the heart and open pathways both physically and emotionally. They are valued in treating anxiety, panic attacks, and grief in addition to relieving the physical and emotional effects of stress and insomnia. 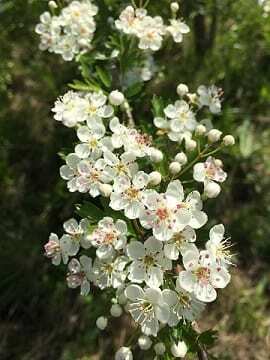 The flowers, leaves, and berries of the hawthorn can be used. 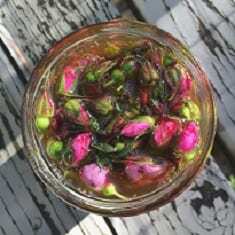 Wild rosebuds before they fully open and the fresh hips in the fall are the best parts to be used. Hawthorn and/or wild rose oxymel is amazingly tasty and soothing to the nervous system. Take note: Some people feel a “swaddling” affect with hawthorn. For most, this is a comforting feeling. For others, it can feel claustrophobic on occasion. Consider Ashwaganda as an effective substitute. The good news is we have choices. We have no control over people, places and things. When we fully understand this concept, there is a sense of freedom that accompanies a feeling of relief. We can let go, turn over control to something bigger than us, and turn our focus on what’s in our hoola hoop, instead of the hoops of others. 1. Breathe! Take time out to stop, breathe, and become aware of your body. Focus on your inhaling and slower exhaling. You may not be aware of it, but your heart slows down upon exhaling, and speeds up when inhaling. This is a healthy exchange between your heart and your head. Focusing on your breathing is a proven way to manage stress, avoid burnout, and calm the rise of panic. 2. Do what you love! There is truth in the concept of doing what you love and money will follow. Start out by setting a timer for 10 minutes and writing down what makes you happy. Pick one thing every day and take time to do it. Notice how it changes your outlook, your level of stress, and your world. 3. Get plenty of sleep. This isn’t just an old wives’ tale. Proper sleep allows the body to metabolize, repair, maintain, relax and heal. 4. Make friends. Social isolation increases physiological damage caused by stress. Friends are people to laugh with, play with, support, and love even with faults. Treat them well and play fairly! 5. Eat well and use your body. 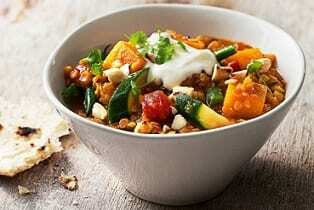 The antioxidants and nutrients in healthy food counterbalance the inflammatory proteins the body produces under stress. Exercise helps to relieve stress and strengthen the body’s systems. Start small and work your way up. 6. Drink half your body weight in water every day. So what if you have to pee more! Peeing is the body’s way of getting rid of metabolites from the cells, excess calcium, and toxins. More water, less anxiety. Proven fact! 7. Turn off technology frequently. It’s now proven that people can be physically addicted to technology. Contrary to popular acceptance, it’s not beneficial, in the long run, to watch Netflix, check your email, post on facebook, and text at the same time. We don’t need to check facebook 25, 50, or 150 times a day. Ask yourself what is more important – letting your “friends” and family on facebook know your every last thought, meal, and selfie, or fully experiencing the moments sans technology. 8. Every night, list 5 things for which you are grateful. It changes your mind by focusing on what is good. Good feeds good. Imagine how your outlook will change as you allow yourself to see the blessings in your life. 9. Do nothing! Are you the person who is the hero for everyone to the detriment of your own physical and mental health? The world will not stop if you take a break & simply be still. 10. Are you in the liminal – or gap – zone, and are finding the transition scary, stressful, and full of uncertainty and struggle? Take heart in knowing that for every season, there is change. The liminal zone does not last. Look for the grace, mercy, and beauty that’s happening all around you, and know, really take it in, that it’s not always going to be this way. Go with the flow, and see where it takes you. You might just be on your way to becoming the person you were always meant to be.